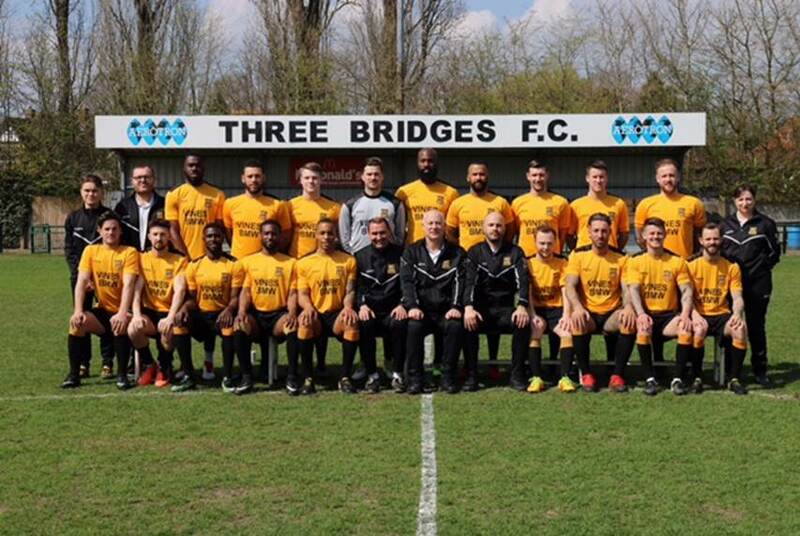 Three Bridges recorded their second away win of the season in dramatic style with captain, Jensen Grant, rising highest in an 89th minute corner to see Bridges claim all three points and see them rise to 16th in the table. It was a slow start to the game with the first chance for either team coming when Ibby Akanbi fired into the side netting on 11 minutes. Bridges continued to dominate the early stages with two more chances coming their way in quick succession. An Akanbi cross nearly looped in on 13 minutes which had Sittingbourne keeper Patrick Lee scrambling. Akanbi was in the thick of the action once again when he played a great ball out to Ami Glloga who put a first time volley into the box but it just evaded everyone. The first half then fell silent for a period, with Bridges dominating but failing to create any clear cut chances and they were nearly punished for this in the 31st minute when Tommie Fagg rose highest from a corner, but Antone Douglas was on the post to clear off the line to keep the score at 0-0. Bridges managed to create the same chance about five times in the first half with crosses from both wings just evading anyone in the area. One final cross from Glloga just missed Omar Folkes as the referee blew for half time. Lee was immediately called into action again fast in the second half after great skill from Glloga saw him flick the ball over a Sittingbourne defender and curl and effort towards goal but Lee made a fine save to deny Bridges a deserved lead. Sittingbourne then should have taken the lead themselves after pinball from a corner saw the ball land at the feet of Ben Fitchett but he blazed his effort way out of the ground. A moment of madness then occurred as Liam Collins was judged to have committed a high foot dangerous tackle on a Sittingbourne midfielder and was sent off. The challenge looked like nothing more than a 50/50 with both players raising their legs high but Collins was seen as committing the foul and Bridges found themselves down to 10 men. Three Bridges then made some substitutions including Connor French coming on and making an immediate impact, instantly winning a free kick which Brannon O’Neill struck wide. Going down to ten men didn’t deter Bridges one bit and they kept looking for that winner and so nearly got it when O’Neill whipped in a dangerous free kick towards the back post and a lunging French narrowly missed the ball. The winner didn’t look like it was going to come and it looked like both teams would have to settle for a draw but in the 89th minute Bridges won a corner and Jensen Grant rose highest to head into the top corner causing mass celebrations and a bundle of 11 players. Bridges saw through the 4 added minutes to secure three valuable points on the road. Bridges next fixture sees them face Bognor Regis Town away in the 3rd Round of the Sussex Senior Challenge Cup on 24th November with a 3pm kick off.